Today I'm featuring a recent read, The Wife by Meg Wolitzer. The excerpts shared are from the trade paperback I purchased to take on vacation. Beginning: The moment I decided to leave him, the moment I thought, enough, we were thirty-five thousand feet above the ocean, hurtling forward but giving the illusion of stillness and tranquility. Page 56: "Here on Bancroft Road, it appeared that I was in a land in which everyone seemed to have stopped themselves from going too far." My thoughts: I haven't blogged at all in January, except for a First Book of the Year post. I had some time off from work and went on a 12-day Caribbean cruise to Puerto Rico, St. Maarten, St. Kitts, Barbados, St. Lucia, and Antigua. Although I brought several books with me, the only one I actually finished was The Wife. I was first attracted to this book when I learned that a movie based on the story had been released, starring Glenn Close, one of my all-time favorite actors. I haven't seen the movie yet, but the novel tells the story of an older couple who have been married for 40 years. Although the book was a bit too slowly-paced for my liking, there were many realistic observations of a long-term traditional relationship centered around a man's career and the sacrifices made by a wife to build and support a husband's success. Wolitzer has a way with words, presenting the situation with astute language and phrasing, and giving readers lots of food for thought. 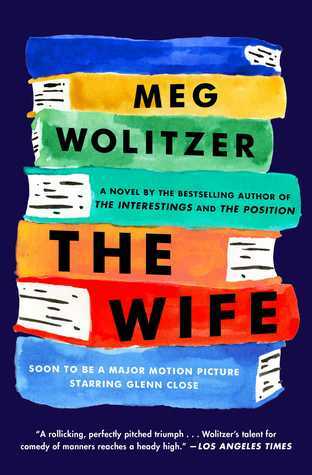 From Goodreads: Meg Wolitzer brings her characteristic wit and intelligence to a provocative story about the evolution of a marriage, the nature of partnership, the question of a male or female sensibility, and the place for an ambitious woman in a man's world. The moment Joan Castleman decides to leave her husband, they are thirty-five thousand feet above the ocean on a flight to Helsinki. Joan's husband Joseph is one of America's preeminent novelists, about to receive a prestigious international award, and Joan, who has spent forty years subjugating her own literary talents to fan the flames of his career, has finally decided to stop. From this gripping opening, Meg Wolitzer flashes back to Smith College and Greenwich Village in the 1950s and follows the course of the marriage that has brought the couple to this breaking point--one that results in a shocking revelation. With her skillful storytelling and pitch-perfect observations, Wolitzer has crafted a wise and candid look at the choices all men and women make in marriage, work, and life. This Friday Focus: The Friday 56 & Book Beginnings post was originally composed and/or compiled and published by Catherine for the blog, bookclublibrarian.com. It cannot be republished without attribution. Sharing this original post on Twitter, Google+ and/or other blogs with appropriate recognition is appreciated. Thanks for the review. I'd like to track this book down. I don't read enough contemporary novels, but this one seems like one I might like. Thanks for mentioning it! First of all, glad to see a post from you, Catherine! Bet you had a good time on your cruise. I'm glad. This is not a book that particularly appeals to me, so I'll likely give it a pass. However, I have other books by this author on my list to read at some point. Wow! Your cruise sounds marvellous! I hope you had a wonderful time! My Friday 56 this week. Sounds like an emotional read, which they are often good! Happy weekend! Sounds like an interesting book but not something I would normally choose. This week I am spotlighting Whispers Under Ground by Ben Aaronovitch as I try to finish a series I just discovered. Happy reading! I liked this book, and according to Goodreads, read it in 2010. I think I actually read it a few years earlier, but only reviewed it in 2010. I loved the movie enough to order a DVD, coming soon. Enjoy! Thanks for your feedback, Laurel. I really want to see the movie! New and not-so-new series keep popping up all the time. Hope you enjoy this one. So true, Freda. Many women in traditional long-term marriages will be able to relate to it. I had a fabulous time! The hard part being back is adjusting to the chilly weather, going back to work, and resuming my reading and blog schedule. It's kind of good to be back, Kay. I missed my blogger friends and their blogs while I was away. Getting back into my routine is a bit challenging, though. As they say, Breana: so many books, so little time! Hope you like the book if you have the chance to read it. What a great reason to not be blogging! Sounds wonderful. The Wife looks good and I had no idea there was a movie! This one looks good too and this is an author I've been meaning to read! This one is very timely, because I think Glenn Close is getting some Oscar buzz for the movie. Hope you had a great time on your cruise. I guess it was a good sign that you were too busy to finish all your books. Congrats on that wonderful vacation! Being back in the N.E. I'm aware of the bone-chilling weather we've all been hostage to! I'm not sure if this book is for me, but with Glenn Close perhaps I'll watch the movie instead. I'm hoping to see the movie soon--I have it on reserve at the library. There were several priceless lines in the book. Even with six days (out of 12) at sea, I found very little reading time, although I enjoyed the relaxation. I've heard great things about the movie and Glenn Close's performance.